World Down Syndrome Awareness Month. Day 3 - Go and explore some new websites. Are you familiar with the Down's Syndrome Association? How about the Down's Education materials? Check out Singing Hands and Makaton materials. All the links are here. 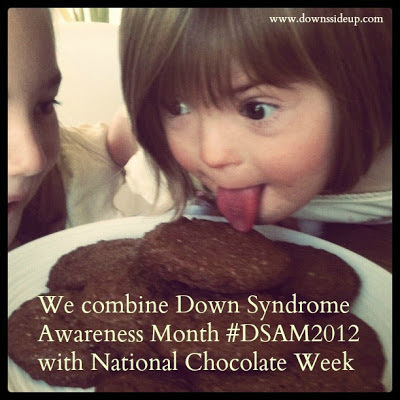 Day 5 - Have you uploaded an image of your child to Downs Syndrome The Big Picture yet? This in an amazing UK-based art project on a scale yet to be seen. Day 6 - Over in America, Noah's Dad is filling a Facebook page full of pictures and stories of children with Down's Syndrome on his Wall of Awesome Pop over and add your inspirational photo and story. Day 8 - A picture speaks a thousand words Browse through our Photo Gallery of Hope. Day 9 - Read an inspirational book, watch a powerful film, open your eyes with an innovative documentary... Here's our list of suggestions Please let us know what your favourites are. Day 10 - Are you taking enough time for yourself? Read my experience of respite... and what happens when you don't take enough. Day 11 - Photographer Richard Bailey and the DSA began the inspirational photographic competition Shifting Perspectives 8 years ago. Each year it features different aspects of Down's Syndrome. Our friend Rory was a winner last year and he is a photographer with Downs Syndrome. The beauty of this exhibition is that it is available as a free app for your iPhone or iPad. Day 15 - Watch the little film we made with a few other families to promote a local tourist attraction. Natty is wearing bright green trousers and is hard to spot as she is just like all the other kids in the piece. Just one of the gang. Eden: The Butterfly Effect. Day 16 - Shabang have produced an amazing 2013 calendar featuring lots of gorgeous children with disabilities. What wonderful role models they are indeed! Buy your copy here while stocks last. Day 17 - I am so envious of anyone who lives near enough to attend the amazing Disability Rocks Festival in Leeds this December. Not least because our idols Singing Hands will be there. If you do live within travelling distance, check out the event here. And here is Wednesday's BBC Radio Devon interview with Fitz on the subject of proposed changes to Universal Credits. Click here. 35 minutes in. Day 21 - The British Institute of Learning Disabilities are an amazing group of people who offer research, support and training for adults with learning disabilities. I was recently honoured to be asked to take part in their annual conference and deliver the keynote speech. To say the it was a learning curve for me is an understatement. Read about my experience here. Day 23 - Now it's time to really get invovled.It's time to share your stories. Day 26 - Natty wrote her name independently for the first time yesterday. Here are a collection of ideas that have worked for us on her journey towards writing. Writing Tips for Children with Down Syndrome from Jolly Phoics, to Ruth Miskin. There's a little video too, filmed by Natty's big sister. Day 28 - Spread the Word to end the R Word. Sign an online pledge to never use such language and read the beautiful letter from the Special Olympics athlete with with DS to those who use insulting language to refer to those with learning disabilities. Day 29 - Medical Mondays by Jen Logan over at Down Wit Dat. Jen is a nurse and Mum of twins, one of whom has DS. She is a font of all knowledge. Pop over to read about the brain, thyroid and history of DS. Day 30 - The Down Syndrome Research Foundation work for medical research to improve and maintain the quality of the lives of those with Down Syndrome. There is a group in the USA and in the UK. Read about the latest trials they are involved in above. Day 31 - Down Syndrome Awareness Month comes to an end... Thank you all for joining us. I for one have learnt so much and have been bowled over by the supportive network I am part of.